Makers of Fine Quality Handcrafted Bath Salts, Incense, Oils, Shea Butters, Spell Kits, Vibrational Sprays and Wȳscan Candel Kits. Brighid – Goddess and Saint…. Lugh or Lug is an Irish deity represented in mythological texts as a hero and a High King. He is also known as Lámhfhada, meaning "long arm" or "long hand", for his skill with a spear or sling, Ildánach ("skilled in many arts"), Samhildánach ("Equally skilled in many arts"), Lonnbeimnech ("fierce striker" or perhaps "sword-shouter") and Macnia ("boy hero"), and by mac Ethlenn or mac Ethnenn ("son of Ethliu or Ethniu"). He is a reflex of the pan-Celtic god Lugus, and his Welsh counterpart is Lleu Llaw Gyffes, "The Bright One with the Strong Hand". It is for his wit, his cleverness and his well crafted trickery that Lugh is admired and honoured. He likes both games of skill, such as chess, and physical challenges such as the horse racing which is a traditional feature of Lughnasadh celebrations. Lugh’s father is Cian of the Tuatha Dé Danann, and his mother is Ethniu, daughter of Balor, of the Fomorians. Lugh is not quite a god – as he is half Fomorian–his mother Eithne, daughter of Balor; and half Tuatha Dé Dannan–his father Cian, son of Dian Cecht. This fact provides another essential clue to his nature, and to the festival of Lughnasadh. To fully understand Lugh, we have to see that in his essential nature he is crossing boundaries, uniting two often irreconcilable things within his person. He can be seen as the most perfect flowering of these two peoples of Ireland. One day, Balor, of the Fomorians, hears a druid’s prophecy that he will be killed by his own grandson. To prevent this he imprisons his only daughter, Ethniu, in the Tór Mór (great tower) of Tory Island where she cared for by twelve women, who are to prevent her ever meeting or even learning of the existence of men. Meanwhile,on the mainland, Mac Cinnfhaelaidh owns a magic cow who gives such abundant milk that everyone, including Balor, wants to possess her. While the cow is in the care of Mac Cinnfhaelaidh’s brother Mac Samthainn, Balor appears in the form of a little red-haired boy and tricks him into giving him the cow. Looking for revenge, Mac Cinnfhaelaidh calls on a leanan sídhe (fairy woman) called Biróg, who transports him by magic to the top of Balor’s tower, where he seduces Eithne. In time she gives birth to triplets, which Balor gathers up in a sheet and sends to be drowned in a whirlpool. The messenger drowns two of the babies, but unwittingly drops one child into the harbour, where he is rescued by Biróg. Lugh was raised by Taltiu, a Fir Bolg queen, and traditionally fostered also by Manannan on Emain Abhlach till he comes of age. At this point he receives his spear Sleá Bua–"spear of victory" and Manannan’s horse Aonbharr (which could fare over both land and sea) as well as, the boat Wave-Sweeper, his armor and helmet. Now, there is another child born of such a union, Bres Mac Elatha. His father is Fomorian, Elatha, another Fomorian king. 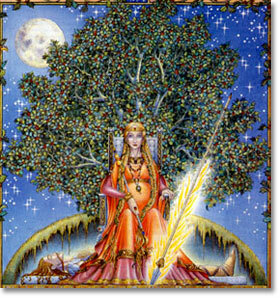 His mother is of the Tuatha Dé Danaan, Ériu daughter of Delbaeth. Thus his parentage, is the opposite to that of Lugh. Like Lugh, he is beautiful to the eye (His name, Bres, literally means ‘beautiful’). Like Lugh, his allegiance lies with the people of his father, and in many ways he is Lugh’s equal and opposite. At this time the Tuatha Dé Danaan are being ruled by King Nuada. After Nuada loses his hand while fighting the Fir Bolg, Bres is chosen by the Tuatha Dé Danaan to succeed him as King. The Tuatha Dé Danaan hope that his succession will encourage the continuation of the alliance between the Fomorians and themselves. Sadly, the rule of Bres is characterised by bad government and harsh treatment for the Tuatha Dé Danaan. It is a time of blight and famine. The Fomorians exact exorbitant tributes and reduce the powerful Gods Ogma and the Dagda to the level of servants. The Tuatha de Danaan eventually rebel, whereupon Bres sets out to crush them with military force, but does not succeed. Who the Fomorians are and where they came from is never made clear. Sometimes they are portrayed as monstrous, typically with one eye, one leg and so forth. At other times, they are indistinguishable from the Tuatha Dé Danaan in both beauty and culture. The most likely theory is that they are Gods of the land, or possibly of the Underworld. Whatever their true nature, their relationship with the Tuatha Dé Danaan is not always good. Initially, the Tuatha Dé Danaan make an alliance with the Fomorians. But it does not last and eventually the Fomorians begin to subjugate the people of the Tuatha Dé Danaan. It is at this time that Lugh presents himself at Nuada’s court. Lugh’s character and skills are made plain in this tale in which he is attempting to gain entry to King Nuada’s court. None may enter Nuada’s court without having some useful skill. Faced with an impassive gatekeeper, Lugh reels off a great long list of his talents: "Question me: I am a builder. Question me: I am a smith. Question me: I am a champion. Question me: I am a harper" etc. To each boast, the gatekeeper simply replies that King Nuada already has such a man and needs no other. Lugh then says: "Ask the king whether he has one man who possesses all these arts." This finally stumps the gatekeeper, who after consultation with Nuada, admits Lugh to the court, where he wins challenges set him by the other Gods and eventually accepts leadership of the Tuatha de Danaan. Lugh Leads the Tuatha de Danaan in their battle against the Fomorians. The battle culminates in the meeting of Lugh and Balor upon the field. Balor attempts to strike Lugh down by gazing upon him with his single deadly eye. But Lugh, agile and clever, casts a sling-stone into the eye, so that the poison from it falls upon the Fomorian fighters. "That does not rescue thee," said Lugh to Bres; "but less than that rescues thee." "How shall the men of Ireland plough? How shall they sow? How shall they reap? After making known these three things thou wilt be spared." "Tell them, said Bres, that their ploughing be on a Tuesday, their casting seed into the field be on a Tuesday, their reaping on a Tuesday." So through that stratagem Bres was let go free. While Lughnasadh was inaugurated in honour of Lugh’s foster mother, another reason behind the celebration is the victory of Lugh, and the release of the harvest for use by the people. In the tale above, the contrast between the reigns of Lugh and Bres evident. While Bres brings hardship and famine to the people, the victory of Lugh brings forth a time of good harvests and abundance. Sites traditionally associated with Lughnasadh and with Lugh himself are often high, hilltop places. In ancient times, this was the time for the settling of legal disputes, arranging of marriages, and the hiring of hands for the coming harvest. It was also a time when musicians and craftsmen would show off their latest creations, perhaps hoping to gain patronage in a wealthy household over the winter. Horse racing features in most descriptions of Lughnasadh celebrations. It seems to have had several purposes. First and probably foremost, it was a good way of displaying the prowess of the horse you had to sell or offer for breeding. Secondly, it was a way for the riders to gain prestige. In the tales of the Fianna, we hear that at Lughnasadh, the warriors would be looking for a place in which to spend the winter, offering protection in return for hospitality. Winning a horse race, or excelling at one of the other games of physical prowess would be a good way of demonstrating your worth. Lugh is the Celtic version of the dying and reborn God and his festival day is Lughnasadh on August 1. As Lugh is the "Sun King" his earthly mother Tailte is the "Great Mother". Tailte gave her people the gift of cultivation, she cleared the land and taught her people how to sow and reap the crops. It was such a tremendous effort that Tailte weakened and began to wither and die. Before she succumbed she told her people that her son Lugh the Sun King would pour his spirit into the grain which would sustain them over the long winter. She asked that they honor Lugh’s sacrifice at the harvest of the grains. Lugh greatly mourned the death of his foster-mother and asked that the people honor her and their own crops with a day of merriment and thanksgiving for the bounty of the harvest. At Lughnasadh Lugh is honored for his gift of life poured into the grains. So how to celebrate Lughnasadh in modern times? Holding the festival upon a hill would be very appropriate. Most of the sites associated with Lugh are hills, often with a natural water source. The rite should include an offering to Lugh and to the local Gods and spirits of your locality, perhaps of summer fruits, the first sheaf of the crop, or of food or drink made from these things. Above all, a great deal of fun should be had. Games are easy to organise, these could be physical or mental challenges. Chess is appropriate, or you could try your hand at ancient board games such as fidchell. A bardic contest would be a good way to enjoy the skills of singers, poets and storytellers. Horse racing is impractical for most people, but hobby horse racing is a wonderful alternative. You could also organize other fun races such as three legged, egg and spoon or sack racing. And as befits a harvest festival, include a feast of seasonal produce. Bread baked from the first of the wheat crop, summer berries, fruit juices, wines and mead.